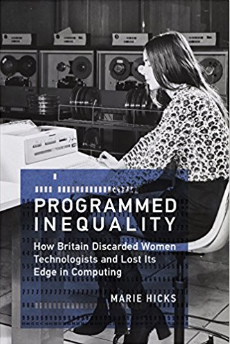 In Programmed Inequality, Marie Hicks explores the story of labor feminization and gendered technocracy that undercut British efforts to computerize. That failure sprang from the government’s systematic neglect of its largest trained technical workforce simply because they were women. Women were a hidden engine of growth in high technology from World War II to the 1960s. As computing experienced a gender flip, becoming male-identified in the 1960s and 1970s, labor problems grew into structural ones and gender discrimination caused the nation’s largest computer user―the civil service and sprawling public sector―to make decisions that were disastrous for the British computer industry and the nation as a whole.